There are situations where your network administrators will not allow you to connect more than one device to the network for various reasons. Of course, there should be the option of paying for an extra device, but why do that when you have Connectify Hotspot? Just connect all your devices to a WiFi hotspot created with Connectify*. This is the easiest route to hassle-free Internet in this context. Learn more on how to create a WiFi hotspot at https://www.youtube.com/watch?v=n5saCAZs0Do. * If you're uing Connectify 2016 or older, in the Settings menu look for NAT Options > Stealth Mode and enable all options there. If the suggestion above doesn't help, you can share a VPN over WiFi or Ethernet. 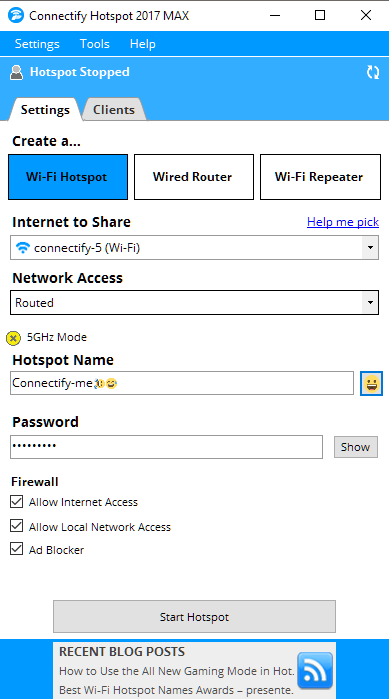 Use a VPN program and pick the VPN as the “Internet to Share” in Connectify Hotspot’s interface. This way, your network admins will see nothing else but that you’re running a VPN program, if that’s something they accept. This also has the effect that the clients are only borrowing your Internet connection, not getting access to your local area network (which might be what the administrators are trying to protect). Note: If it’s really important, Option #2 (Using a VPN) is the safest option for protecting your security on any network.